"A delicate, flavorful dish that will satisfy vegans and carnivores alike! Inspired by my family's deep Coptic Orthodox Christian tradition, this is a great meal alternative during strict fasting times. It contains no animal products or fats, but has enough flavor and visual impact to make you feel like you're not sacrificing a thing! I hope you will enjoy this recipe. Add chicken or prawns to make this vegan dish a carnivorous delight!" Bring 1 1/4 cup vegetable broth and water to a boil in a saucepan, stir in couscous, and mix in salt and black pepper. Reduce heat to low and simmer until liquid is absorbed, about 8 minutes. Heat 3 tablespoons olive oil in a skillet over medium-high heat; stir in pine nuts and cook, stirring frequently, until pine nuts smell toasted and are golden brown, about 1 minute. Remove from heat. Heat remaining 2 tablespoons olive oil in a saucepan; cook and stir garlic and shallot in the hot oil until softened, about 2 minutes. Stir black olives and sun-dried tomatoes into garlic mixture and cook until heated through, 2 to 3 minutes, stirring often. Slowly pour in 1 cup vegetable broth and bring mixture to a boil. Reduce heat to low and simmer until sauce has reduced, 8 to 10 minutes. Transfer couscous to a large serving bowl, mix with sauce, and serve topped with parsley and pine nuts. easy to make. i used little cous cous cause my supermarket didnt have pearl cous cous. it was fine. i also put in cut up steak strips after the sundried tomatoes and olives. Everyone really liked it. I added chicken to the left overs and that was also very tasty. FABULOUS recipe!!!! 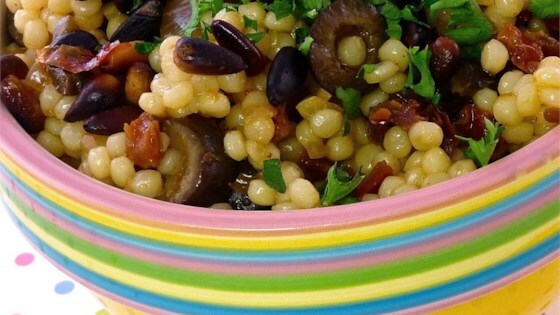 Delicious taste combination with the pine nuts, olives, and sun dried tomatoes. One Orthodox to another, thank you for a tasty Lenten recipe!